If every Atome a Creatures Figure beare. From 'Of Many Worlds in this World', in Poems and Fancies (1653), 44-5. Where faith commences, science ends. Both these arts of the human mind must be strictly kept apart from each other. Faith has its origin in the poetic imagination; knowledge, on the other hand, originates in the reasoning intelligence of man. Science has to pluck the blessed fruits from the tree of knowledge, unconcerned whether these conquests trench upon the poetical imaginings of faith or not. In Ernst Haeckel and E. Ray Lankester (trans. ), The History of Creation (1880), Vol. 1, 9. In 'A Man Said to the Universe', Poem 21 in War Is Kind (1899). In Stephen Crane and Joseph Katz (ed. ), The Complete Poems by Stephen Crane (1972), 139. Consciousness is not wholly, nor even primarily a device for receiving sense-impressions. …there is another outlook than the scientific one, because in practice a more transcendental outlook is almost universally admitted. …who does not prize these moments that reveal to us the poetry of existence? Swarthmore Lecture (1929) at Friends’ House, London, printed in Science and the Unseen World (1929), 44. 'The Marriage of Heaven and Hell' (1790). In W. H. Stevenson (ed. ), The Poems of William Blake (1971), 106. Fossil bones and footsteps and ruined homes are the solid facts of history, but the surest hints, the most enduring signs, lie in those miniscule genes. For a moment we protect them with our lives, then like relay runners with a baton, we pass them on to be carried by our descendents. There is a poetry in genetics which is more difficult to discern in broken bomes, and genes are the only unbroken living thread that weaves back and forth through all those boneyards. The Self-Made Man: Human Evolution From Eden to Extinction (1996), 13. I am ill at these numbers. 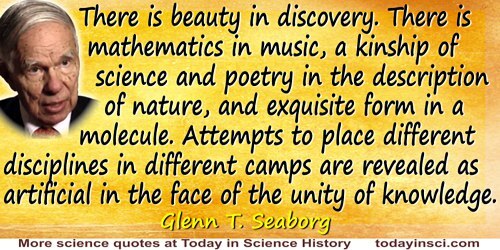 In the earliest ages science was poetry, as in the latter poetry has become science. In literary essay, 'Witchcraft' (1868), collected in The Writings of James Russell Lowell in Prose and Poetry (1870, 1898), Vol. 2, 359. Language is the archives of history… . Language is fossil poetry. From 'The Poet', Essays: Second Series, Essays & Lectures (1983), 457. Mathematics and Poetry are … the utterance of the same power of imagination, only that in the one case it is addressed to the head, and in the other, to the heart. From a review of William Rowan Hamilton’s, Lectures on Quaternions (1853), in 'The Imagination in Mathematics', The North American Review (Jul 1857), 85, No. 176, 230. Also in Robert Édouard Moritz, Memorabilia Mathematica; Or, The Philomath’s Quotation-book (1914), 189. The original text has “Mathematics…” but the latter text gives “Mathesis…”. The ellipsis is for the word “therefore”. Aphorism 365 from Selected Aphorisms from the Lyceum (1797-1800). In Friedrich Schlegel, translated by Ernst Behler and Roman Struc, Dialogue on Poetry and Literary Aphorisms (trans. 1968), 147. From Gifford Lecture, Edinburgh, (1927), 'Pointer Readings', collected in The Nature of the Physical World (1928), 252. In Charles Darwin and Francis Darwin (ed. ), Charles Darwin: His Life Told in an Autobiographical Chapter, and in a Selected Series of His Published Letters (1892), 8. As given in obituary, Myrna Oliver, 'Arthur Lerner; Promoted Use of Poetry in Therapy', Los Angeles Times (8 Apr 1998), quoting from a The Times article (1987). Perhaps the strongest bond of sympathy between mathematics and poetry, however, is the endless invention of each. Dr. Johnson remarked, “The essence of poetry is invention; such invention as, by producing something unexpected, surprises and delights”; but he might have said the same of mathematics. In 'The Poetry of Mathematics', The Mathematics Teacher (May 1926), 19, No. 5, 295. Literary Character of Men of Genius, Chap. 12. In In Jehiel Keeler Hoyt, The Cyclopedia of Practical Quotations (1996), 270. Poetry creates life; Science dissects death. Lectures and Addresses on Literary and Social Topics (1859), 123. In James Wood, Dictionary of Quotations from Ancient and Modern, English and Foreign Sources (1893), 382:26 . Quantum provides us with a striking illustration of the fact that though we can fully understand a connection … we can only speak of it in images and parables. We must be clear that when it comes to atoms, language can be used only as in poetry. The poet, too, is not nearly so concerned with describing facts as with creating images and establishing mental connections. In conversation during first meeting with Werner Heisenberg (summer 1920), as quoted in Werner Heisenberg and Arnold J. Pomerans (trans. ), Physics and Beyond: Encounters and Conversations (1971), 41. As cited in Philip Kuberski, The Forgèd Feature: Toward a Poetics of Uncertainty: New and Selected Essays (1995), 177-178. Notebooks and Diaries (1838). In The Columbia World of Quotations (1996). 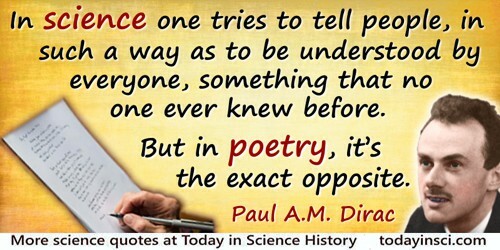 Science is for those who learn; poetry for those who know. In Meditations of a Parish Priest: Thoughts, Pt. 1, No. 71, translated from the third French edition by Isabel Florence Hapgood (1886), 43. Science sees signs: poetry, the thing signified. Shakespeare was pursuing two Methods at once; and besides the Psychological Method, he had also to attend to the Poetical. (Note) we beg pardon for the use of this insolent verbum: but it is one of which our Language stands in great need. We have no single term to express the Philosophy of the Human Mind. The Task and Other Poems, Book III, The Garden (1785). In John D. Baird and Charles Ryskamp (eds. ), The Poems of William Cowper (1995), Vol. 2, 1782-1785, 166-7. Sound travels farthest as music; the most telling form of truth is poetry. The interpretations of science do not give us this intimate sense of objects as the interpretations of poetry give it; they appeal to a limited faculty, and not to the whole man. It is not Linnaeus or Cavendish or Cuvier who gives us the true sense of animals, or water, or plants, who seizes their secret for us, who makes us participate in their life; it is Shakspeare [sic] … Wordsworth … Keats … Chateaubriand … Senancour. 'Maurice de Guerin' Essays in Criticism (1865), in R.H. Super (ed.) The Complete Prose Works of Matthew Arnold: Lectures and Essays in Criticism (1962), Vol. 3, 13. The sublime can only be found in the great subjects. Poetry, history and philosophy all have the same object, and a very great object—Man and Nature. Philosophy describes and depicts Nature. Poetry paints and embellishes it. It also paints men, it aggrandizes them, it exaggerates them, it creates heroes and gods. 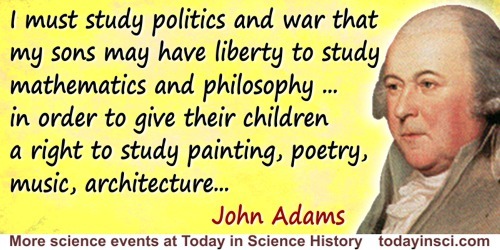 History only depicts man, and paints him such as he is. 'Discours Prononcé a L' Académie française par M. De Buffon. Le Jour de sa Reception 25 Aout 1753'. Supplement a T.iv (1753), Histoire Naturelle, Générale et Particulière, Avec la Description du Cabinet du Roi (1777), 11. Trans. Phillip R. Sloan. of Fire and the Wet, Earth and the wide Air of the World. But the four we have always with us, they are our world. Or rather, they have us with them. 'The Four', David Herbert Lawrence, The Works of D.H. Lawrence (1994), 593. Two kinds of symbol must surely be distinguished. The algebraic symbol comes naked into the world of mathematics and is clothed with value by its masters. A poetic symbol—like the Rose, for Love, in Guillaume de Lorris—comes trailing clouds of glory from the real world, clouds whose shape and colour largely determine and explain its poetic use. In an equation, x and y will do as well as a and b; but the Romance of the Rose could not, without loss, be re-written as the Romance of the Onion, and if a man did not see why, we could only send him back to the real world to study roses, onions, and love, all of them still untouched by poetry, still raw. C.S. Lewis and E.M. Tillyard, The Personal Heresy: A Controversy (1936), 97. Where weakness is the only sin. In The Ascent of Man (1889), 13. In Phebe Mitchell Kendall (ed. ), Maria Mitchell: Life, Letters, and Journals (1896), 186. We have refused to recognize the creativity of youth. We don’t want our children to write poetry or go to the stars. We want them to go steady, get married and have four children. Without poetry our science will appear incomplete, and most of what now passes with us for religion and philosophy will be replaced by poetry. Thomas Humphry Ward (ed.) with Introduction by Matthew Arnold, The English Poets: Chaucer to Donne (3rd. Ed., 1880), Vol. 1, xviii. From Selected Aphorisms from the Lyceum (1797-1800). As translated by Luis H. Gray in Kuno Francke and Isidore Singer (eds. ), The German Classics: Masterpieces of German Literature Translated Into English (1913), Vol. 4, 177. [The popular impression about some chemists is that] the aquafortis and the chlorine of the laboratories have as effectually bleached the poetry out of them, as they destroy the colours of tissues exposed to their action. 'The Alleged Antagonism between Poetry and Chemistry.' In Jesse Aitken Wilson, Memoirs of George Wilson. Quoted in Natural History Society of Montreal, 'Reviews and Notices of Books,' The Canadian Naturalist and Geologist (1861) Vol. 6, 391.